Loved this book. Go buy it!! Hadley is flying out from America to London for her father’s wedding. Unfortunately she misses her plane by a mere 4 minutes and is forced to take the next flight. Not so unfortunately she runs in to Oliver, a Brit, who is also flying to London. Sitting next to each other on the seven hour flight Hadley and Oliver share stories, although Hadley does most of the sharing, (she really, really doesn’t want to go to this wedding). Hadley shares with Oliver how she feels about her father, who essentially dumped her and her mother when he got a teaching position in England and created a new life for himself across the Atlantic. Now, if you’re the kind of reader that tries to guess what’s going to happen before you turn the page, you might think Oliver remains fairly elusive throughout the flight… I was thinking it. And then of course it all became clear why he seemed this way when the flight was over and the pair headed off in different directions. Right before they are separated at customs Oliver kisses Hadley. Normally I’m terribly allergic to third person narrative, but this story is so wonderfully written I didn’t get the urge to itch once. I highly recommend giving The Statistical Probablity Of Love At First Sight a read. 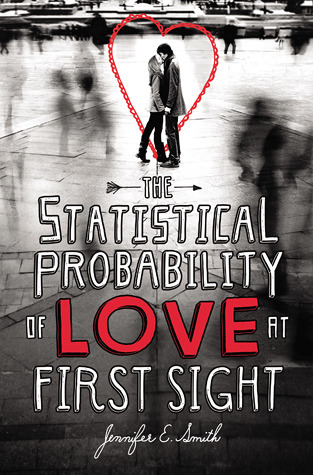 Posted by bookishblurb on November 14, 2012 in Review and tagged Books, Jennifer E. Smith, The Statistical Probability of Love at First Sight, YA. Same here! I was ALL about dystopians and then I found a few awesome contemps and I’m getting really into them!